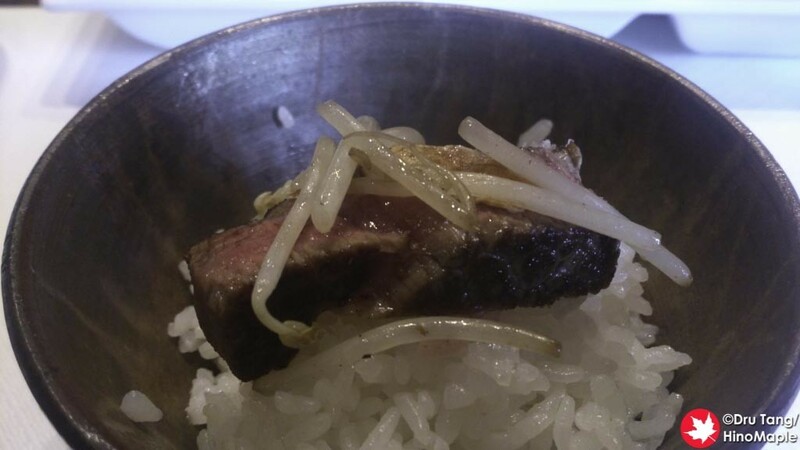 When I was down in Kobe, my brother wanted to try Kobe beef. I am not a big wagyu person, but since he was on vacation and his friends who were also visiting Japan at the time wanted to eat Kobe beef, I couldn’t say no. I don’t regret going and it was a good experience, but I did feel it was a little overpriced. 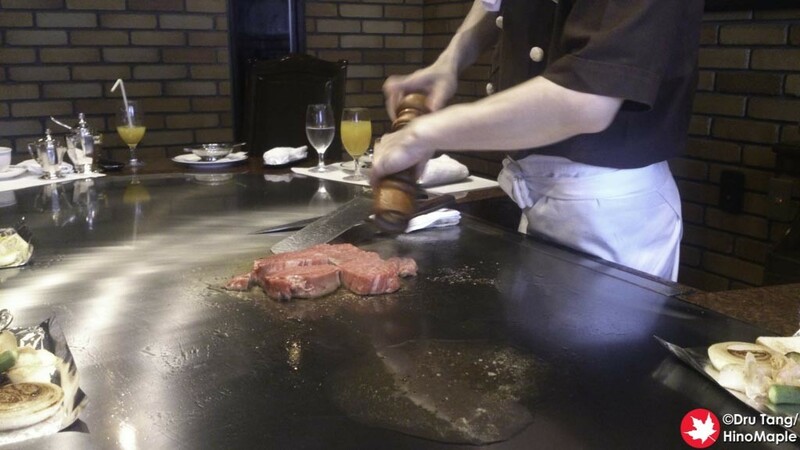 I have been to Kobe a few times and while I did have regular cheap Kobe beef, I have never been to a fancy beef steak restaurant. 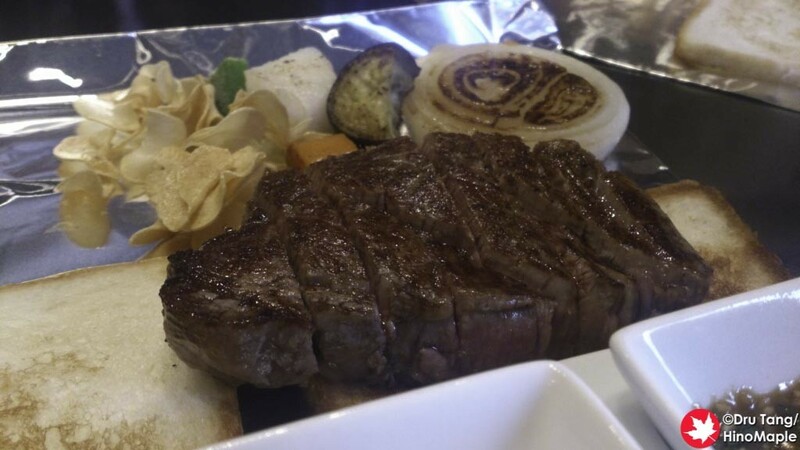 My brother’s friend made a reservation at a restaurant called Beef Steak Kawamura and after searching a little for the shop we finally found it. The outside looks like an older European influenced building and inside the decor calls back to the 1970s. When you enter the restaurant, there is a small entrance with just a few seats. The servers and chefs not very good at English but there were a lot of foreign tourists when I visited. 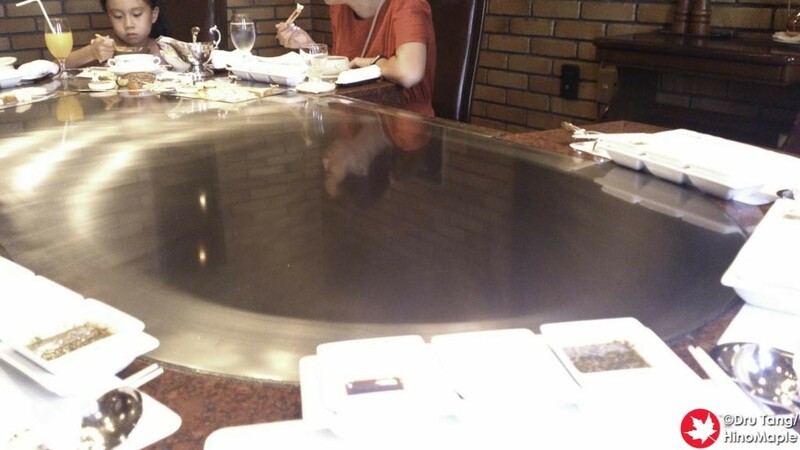 We had reservations so we only had to wait a couple minutes while they prepared our table. 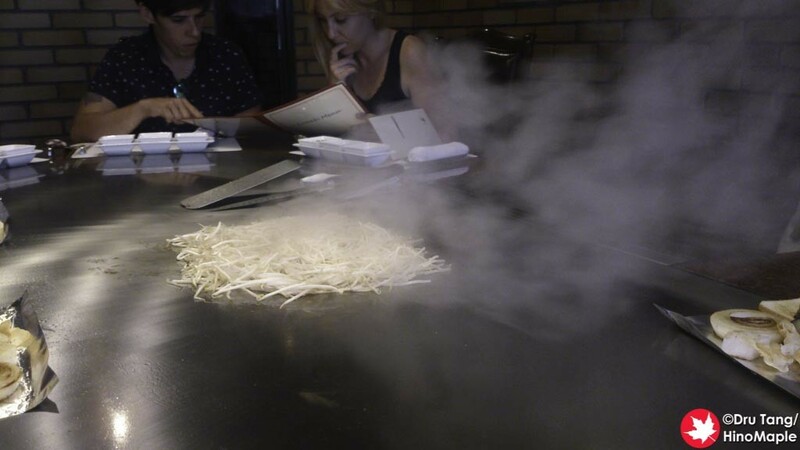 When we got seated there was already a small Chinese family at our table and they were just starting to cook the beef. Each table can seat roughly 10 people and there is a nice large griddle in the middle. 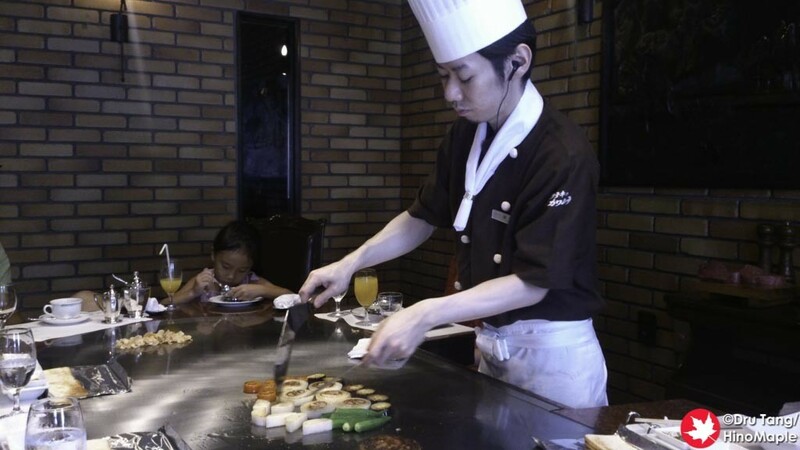 You get your own personal chef for your meal and they make sure everything is cooked and served right on time. For lunch, there are a lot of different options. If you look at the English website, do note that it hasn’t been updated in a few years, maybe 2012, so the prices are a little higher now. If you can read Japanese, the current prices are listed, but the food is the same. They haven’t changed the menu much, if at all, and it is all pretty standard. While my brother and his friends decided to get the Kobe beef lunch set, I and his Japanese friend decided to get the S set which was almost the same but with regular wagyu (Japanese beef) instead. The Kobe beef was fattier but in all honesty I don’t think I would have noticed a difference. I didn’t get a chance to try the Kobe beef itself but the food is generally enough for one person. The only time you may need more food is if you usually eat a lot. The first dish at Kawamura was the beef aburi. Aburi means that it is quickly seared so the inside is still raw. 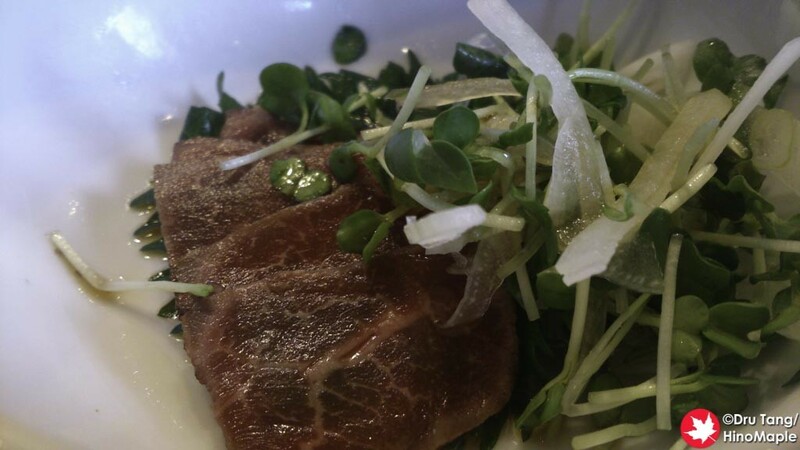 The beef is plated with a little salad and a ponzu sauce is put on top. In reality the beef was raw and we thought it was beef sashimi. 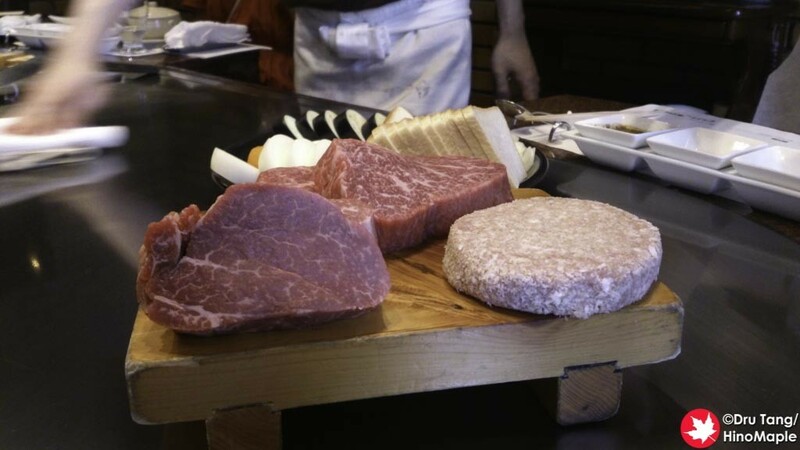 They use the same grade of beef that you get with your steak and if you get the Kobe beef set the look is slightly different too. The second plate was the corn portage. This is a very typical Japanese staple when it comes to western food. 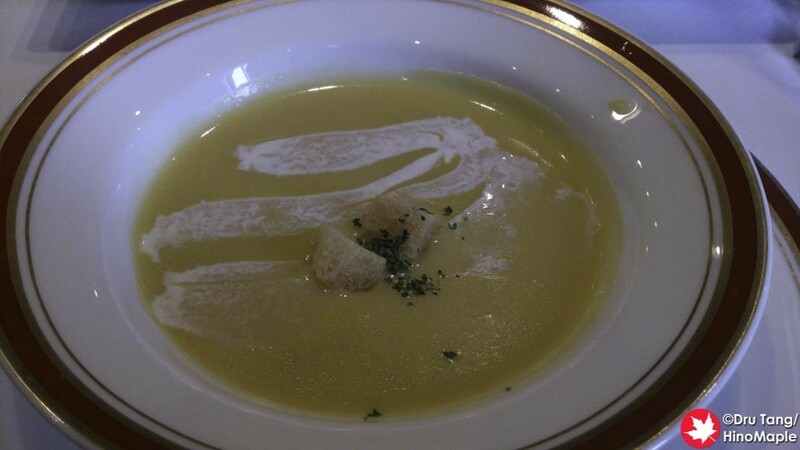 Just take a cream corn soup and blend it until it is silky smooth. I thought it was really good and much better than instant corn portage, of course. Next up is the salad. The salad is a little small and really simple. They used a Thousand Island or Cobb style dressing and it was a little heavy to be honest. 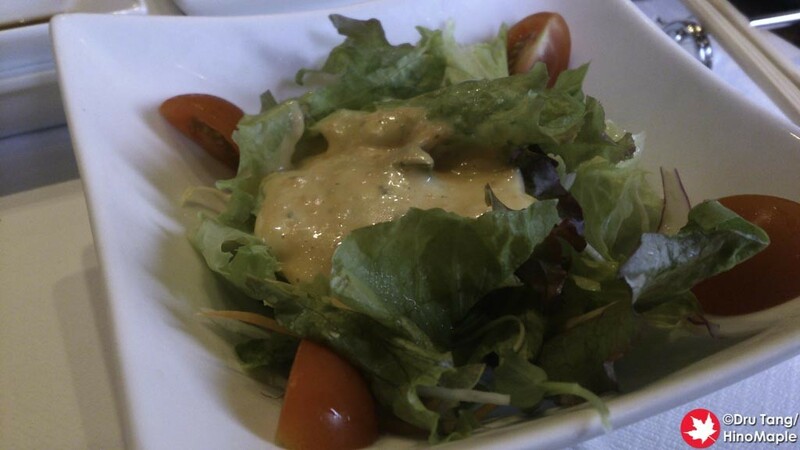 I have lost my taste for using a lot of salad dressing and while you can probably put some of the dressing to the side, after you mix it up, it is difficult to take it away. It was still really good though. As you start eating your soup, the chef arrives and starts preparing the side dishes and meat. At first he grilled some garlic in a lot of oil. 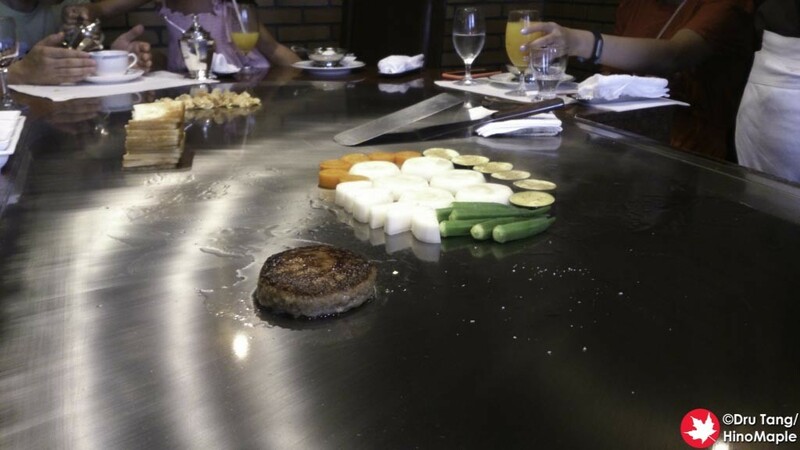 He also started the hamburg steak, which one person in our group was eating. This was surrounded by thin slices of bread which was used as a plate for our steak. If you are visiting, the chef will ask you if you can eat garlic as some people don’t like it. He also tells you that the bread is not to be eaten until you finish your steak. 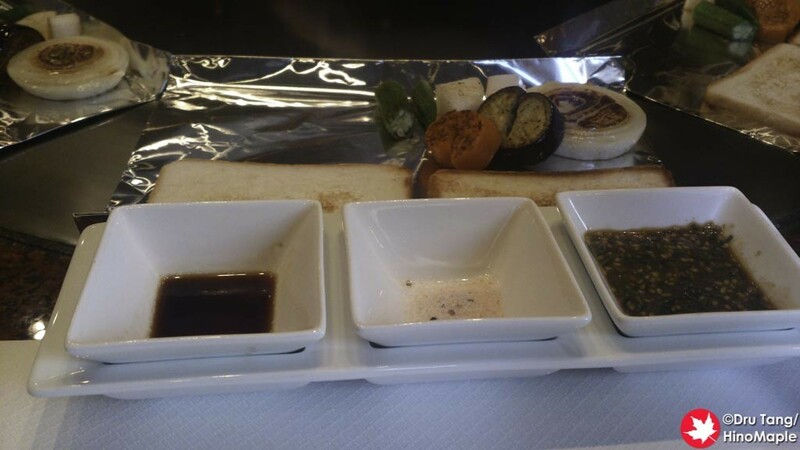 Once the bread is toasted, the chef proceeds to cook the vegetables. 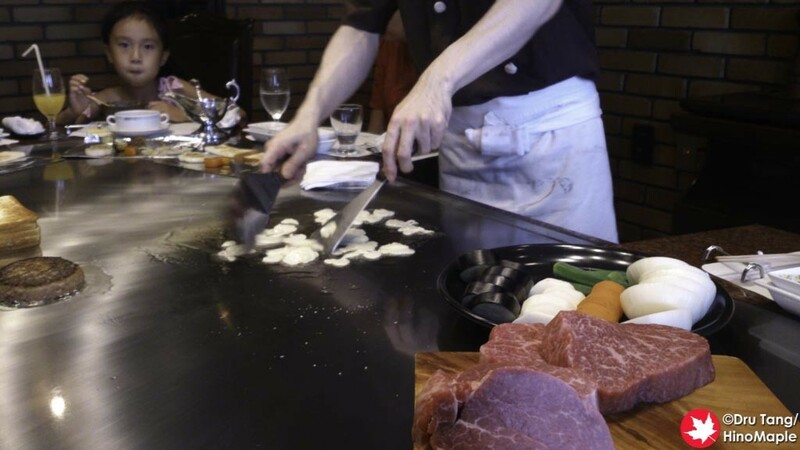 He delicately cooks the vegetables on each side ensuring that it is fully cooked and browned nicely. He then proceeds to cut them into bite size portions and make sure it is all portioned nicely to everyone. At this time you are also given 3 dipping sauces. From my memory, there is soy sauce, salt mixture, and a spicy miso soy sauce (from left to right in the picture below). The sauces were nice and they all created a different taste for the vegetables. You also use it for the steak once it is done and it also creates a different flavour so use the one you like the most. After this it was steak time. The chef asked us how we wanted our steak and we all wanted medium rare. It was pretty easy and he even smiled when we commented that it was easy for him. It doesn’t take long to cook the steak, depending on how you want it done. Once it is done, it is placed neatly on the slices of bread and you begin eating the steak. The steak was delicious and I was happy to have such a luxurious meal in such a luxurious restaurant. Once the steak was cooked, the final dish is prepared. The chef proceeds to make sautéed bean sprouts and places it on your plate as well. At this point things quiet down and you just enjoy the rest of your meal. 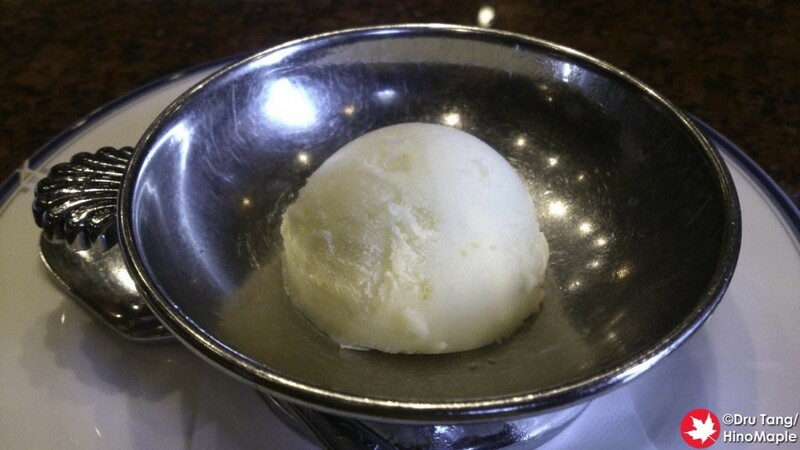 Once the main course is done you get a little ice cream, which I believe was a yuzu blend for us, and a choice of drink. You can choose between coffee or tea (iced or hot) as well as juice. After you finish it is time to head to the entrance to pay the bill and leave. 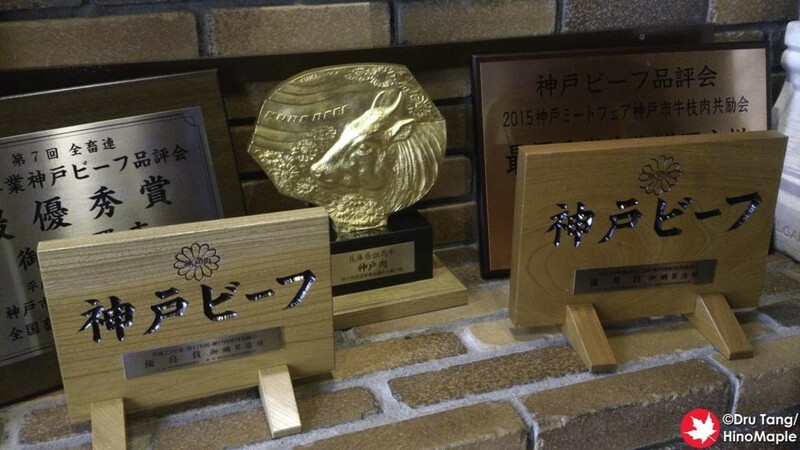 Kawamura is a great place to eat and a once in a life time experience. I say this because there is little chance that I will ever choose to go to such a restaurant again. I don’t regret paying so much for a meal (5000 yen) but part of that price was the experience. 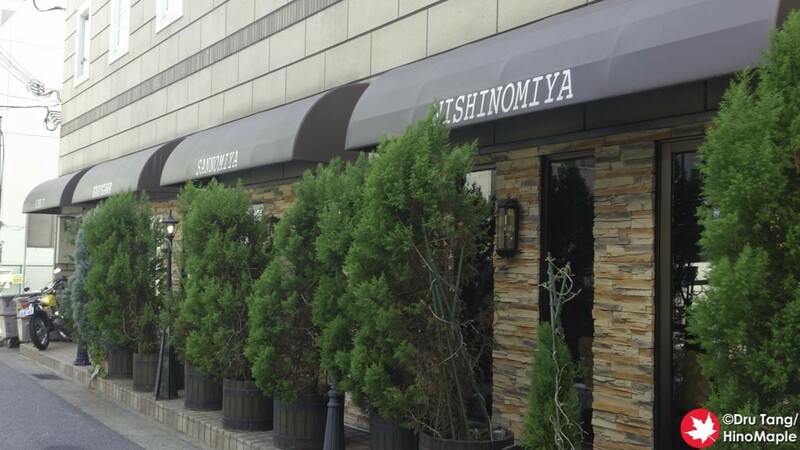 The quality of service is very high and the food quality was also very high. I can understand why it was priced that high as they really take pride in the quality of the product. Whether or not my barbarian palate can understand the difference is a different question, and hence why I doubt I’ll ever go back. If you do have a chance, don’t hesitate to try it. 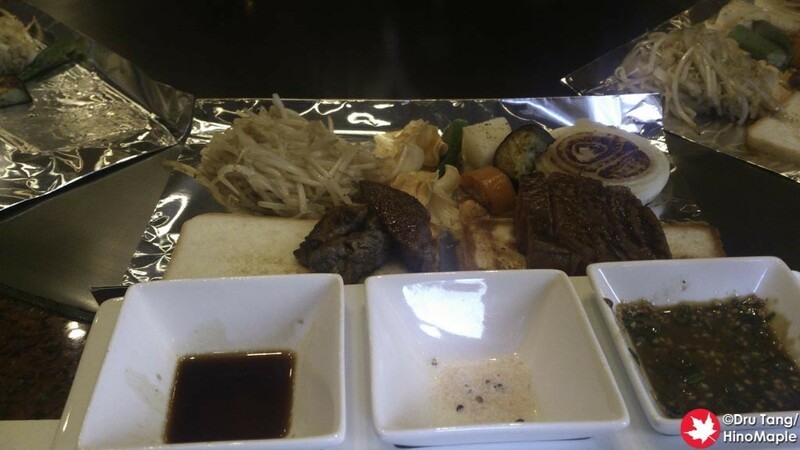 This entry was posted in Kansai Food and tagged Beef, Beef Steak, Beef Steak Kawamura, japan, Japanese Beef, Kawamura, Kobe, Kobe Beef, steak, Wagyu by Dru. Bookmark the permalink.